Yes, another post on "is sprinting Pose running?" I think that some people say that, yes, sprinting is Pose running either due to the parallels during parts of the sprinting phases, or because they have a broader definition of what falls under Pose running than myself or other that disagree would say. - a bod lean that draws a line through the head, hips, and ball of foot where the final push off the ground occurs. Also occasionally called "Chi Running"
Conversely, with sprinting, you're looking at going as fast as you can for as far as your can. While, no one needs to worry about finishing a 200 m run, if you can delay slowing down after hitting top speed as much as possible, well, that's where a sprinter's "endurance" comes into play. But that's neither here nor there. The drive phase is the most recognizable in a pose sense, you have the push off directly in line with the shoulders and hips. The athlete is in a dramatic lean that indicates the speed or acceleration. This typically lasts for 10 - 15 meters. The main similarities you can point to are: 1) They are both on the forefoot. 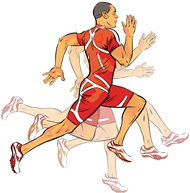 2) The landing catches under the athlete's center of gravity (though the sprinter is far more upright). Therefore, depending on what main characteristics one takes into consideration when classifying something as pose or not-pose running will decide if you think sprinting is pose running. I, personally, am of the opinion that it is a different technique entirely.